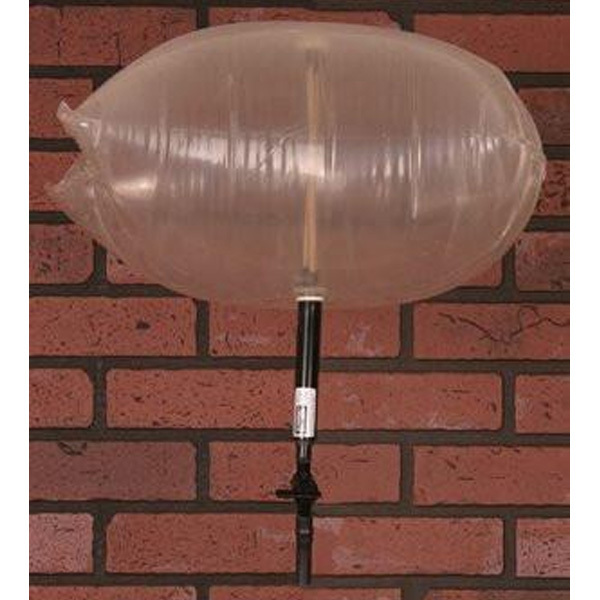 This Chimney Balloon is an inflatable plug that prevents drafts from a chimney caused by a broken, warped, or missing flue dampers. A chimney damper is made of metal and frequently heated and cooled. The chimney damper can warp or break over time and use, and this causes a cold air draft to enter the home. The Chimney Balloon stops this air leakage by acting as a chimney plug to save money, heat, and comfort. This Chimney Balloon is designed to work on small circular, rectangular or square chimney flues. With safety goggles on, look into your chimney with a flashlight and identify the damper (a metal flap that closes the chimney), if you have one. Also, identify the most narrow section of your chimney that you can touch with a 2 foot stick. Follow these guidelines when selecting an area to install a Chimney Balloon. Select an area that is not interfered with by the damper flap or any hardware. The area must have about 6″ in height of parallel or slightly sloping walls with significant texture for the balloon to grab and lodge in during inflation. Just above the damper, or in the bottom of the smoke shelf, is often an ideal location to install a Chimney Balloon. If your installation point cannot be easily touched by hand you will want to purchase an HEK Extender with your Chimney Balloon. Measure the length and depth of the location you choose to install a Chimney Balloon. It is possible to measure with a standard tape measure, but it is easier to measure with a foldable carpenters ruler. We recommend that you buy the Chimney Balloon that is exactly the same dimension of your install location. But, It is OK to buy a Chimney Balloon that is up to 6 inches larger in either dimension than your measured opening, since you will be inflating it into place.DO NOT buy a Chimney Balloon that is too small for the measured opening.